After you've had a computer for some time, you've personalized your experience by adding programs and applications, setup and configured your system to work how you require it to, and also all your files, documents, and media are contained all on your hard drive. Your hard drive contains a lot of information that you don't want to lose (Such as your music collection, photos of family, friends, vacations etc, business or study documents.) as well as your personal settings (Such as bookmarks, desktop themes and gadgets among other little things.). The problem is that computers may end up with a virus, corrupted files in the operating system, and many other events that happen from everyday use. Much like you may need to see a doctor or go on a vacation to unwind, computers also need care and maintenance to remain in a working condition. If your computer system has found itself having too many problems, then your best option may be to perform a system recovery on your system. This isn't as bad as it sounds; it's not at all like reformatting your system, where you lose all the information held on your hard drive. 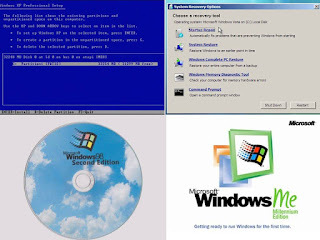 For Windows users, the operating systems (Including XP, Vista and 7.) come with system restore software as standard. The system restore software that comes with Windows operating systems is something that can save you a lot of time, and also a lot of money. This program is set up by you to work automatically, and it sets a restore point of your system, usually of a time when your system was working fine. It remembers the settings that you have chosen, and also the background workings of your operating system, just in case there are any changes to the system files. You can set it to automatically update the system restore point regularly, or you can choose when to set a restore point yourself. When set automatically, you don't have to worry about doing it again in the future, as it will schedule the program itself at an appropriate time. To restore your system to its previous settings, going into the control panel to system recovery will open up a wizard to guide you through the process. Before starting this process, to be safe make a backup of all your files on to an external hard drive (If you have one.) using either a free backup application (Which can be download from the internet or may come built in to your system or external hard drive.). Once this is done, following the wizard, you will be given an option of what system restore point to go to. Sometimes, you may have many restore points to choose from (If you have regularly asked your system to do this.) or there may be one or two options. Depending on how far back in time you want to go will help you decide which one to choose. This is unlikely to delete any of your files in your my documents folders, as it reverts your system files and settings to a time when your computer was in better shape. 0 Response to "Recover Your Settings With Windows System Recovery"